All About Typhoon headed towards Japan Could this be a extinction level event to wreak havoc upon the Earth? A”Super” Typhoon with 150 MPH sustained winds heading for Fukushima the crippled nuclear power plant. 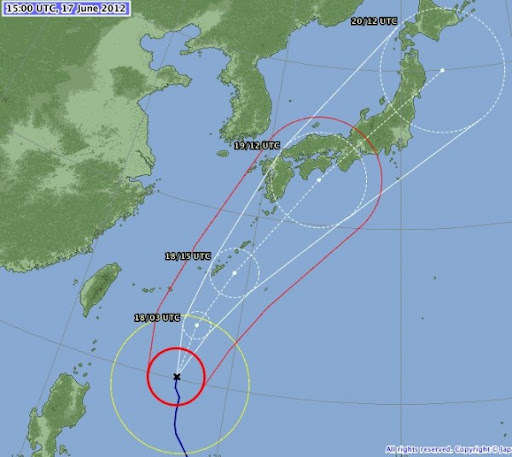 Fukushima nuclear power faces its second typhoon in October, according to the weather agency. The crippled Fukushima nuclear plant is not fully prepared for the heavy rain and winds of a typhoon bearing down on Japan, the plant’s raising the risk of further radiation leaks if storms thrash exposed pools of uranium fuel rods or tanks holding contaminated water. This present course will allow us to see how the storm may be altered to hit Fukushima directly. It is well within the capabilities of technology to steer storms. The NWO is looking for an extinction level event to wreak havoc upon the Earth. Guchol means spice. To add insult to injury, this is a one two punch. There is another tropical storm forming in the South China Sea. This storm will most likely trail Guchol. If they join, what then? The storm is called Talim. In Urdu it means education or learning. In the production of rugs it refers to the description of the number of pile knots and their colours. I saw 194 kmh windspeed listed here… what is going on on our planet? ← Professor Chossudovsky: War on Iran Will Trigger World War 3!